TS AGRICET 2018 Hall tickets / AGRICET & AGRIENGGCET-2018 RESULTS: Question paper and key will be placed in University website: www.pjtsau.ac.in from 22-07-2018 12:00 Noon to 23-07-2018 12:00 Noon. Any queries /challenges on questions and key, please mail to Convenor, AGRICET & AGRIENGGCET-2018, e-mail:agricetpjtsau2018@gmail.com before 1:00 PM 23-07-2018, after which no complaints will be received. i. The total marks secured in AGRICET & AGRIENNCET-2018. ii. The percentage of aggregate marks secured in the qualifying examination i.e., Diploma in Agriculture / Diploma in Seed Technology / Diploma in Agricultural Engineering. iv. If the tie still persists the date of birth of the candidates concerned, the older being given preference over the younger. 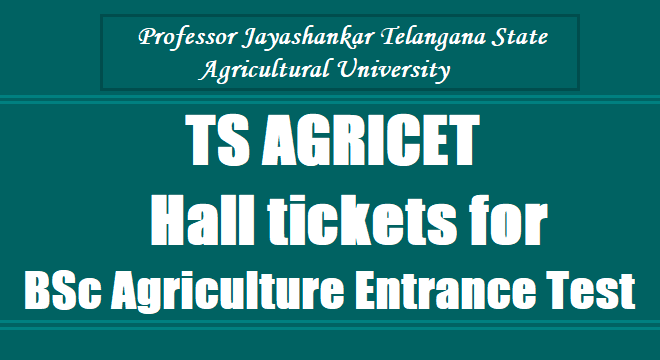 Telangana/TS AGRICET 2018 Notification/Professor Jayashankar AGRICET 2018: BSc Agricultural Course Admissions 2018-18, BSc Agriculture Entrance Test 2018: Professor Jayashankar Telangana State Agricultural University, Hyderabad Registrar issued the TS/Telangana AGRICET 2018 Notification in June, 2018 and the University Officials invited the applications in the prescribed form from the eligible Diploma holders in Agriculture and Seed Technology for admission into First Year B.Sc. (Agriculture) Degree Programme(four years B.Sc. (Ag.) Degree Programme) for the academic year 2018 -18. 1. The list of eligible candidates along with the hall ticket numbers will be displayed in the University website on 11-07-2018 those candidates who have not received the hall tickets can however download the Hall Ticket from the University website and attend the Test. 2. Applications received after the last date will not be accepted. University will not be responsible for any postal delay. So, Candidates may download the hall tickets from web portal.